Mobile eCommerce is becoming increasingly popular. 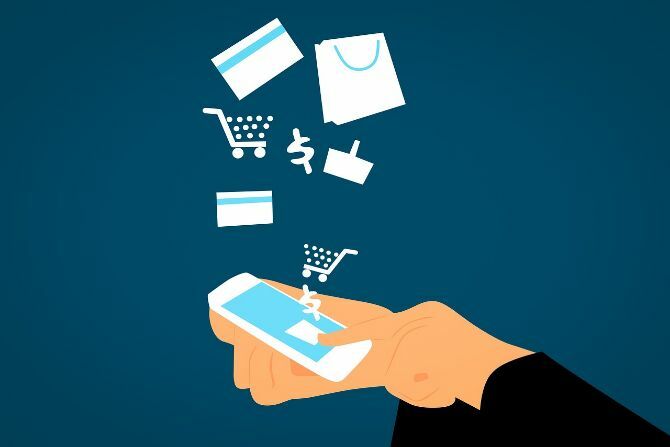 According to Statista and eMarketer, the mobile eCommerce market share will increase from about half of sales in 2016 to nearly three-quarters of sales by 2021. Meanwhile, the number of mobile buyers in the U.S. alone is projected to reach nearly 170 million over the same timeframe. Despite the rise of mobile eCommerce, the user experience on smartphones continues to disappoint. Adobe Analytics found that the revenue-to-visit ratio—an important indicator of UX quality—was 0.60 for mobile phones compared to 1.27 for desktop computers—less than half! Let’s take a look at how to optimize conversion rates in two of the most important areas: Site search and categories. Mobile site search is a prime example of how poor design can hurt conversions. The smaller screen and the lack of fidelity of human fingers make it hard to use search fields while only a handful of search results can be seen at the same time. Despite these challenges, many shoppers still prefer to search for products they want to purchase. There are three strategies that you can use to improve mobile site search and boost conversions by double-digits. Download our checklist of site search best practices that go above and beyond design. A surprising number of eCommerce shops still hide their navigation behind a magnifying glass icon or even in a hamburger menu. Many others have too many input fields (e.g. search and newsletter sign up fields), show only the search field without a button, or use designs that don’t contrast with the background. Make It Obvious: Use a visible search input field and button that is above the fold and contrasts with the background. Let it Breathe: Put enough space around the search field to avoid accidental clicks on other buttons or links. Any mobile phone user will admit that entering text can be challenging at best and downright annoying at worst. When searching for a brand or unusual name, it’s not uncommon to have the phone autocorrect the input to something completely unexpected to generate a “no results found” page. Disable Browser Features: Use HTML tags that disable autocorrect, spellcheck, auto-capitalizing, and other browser features that can frustrate eCommerce shoppers. Enable Autocomplete: Implement autocomplete functionality to help visitors save time and find what they want faster. Incorporate product data to make autocorrect more intelligent. Mobile phones can only show a small number of search results per page compared to desktop computers since there can only be one column with a limited view area. As a result, it’s more important than ever to organize products in a way that helps customers find what they’re looking for faster. Use a Better Search Engines: eCommerce shops using built-in site-search may want to consider implementing a specialized solution, such as Elasticsearch, Search Spring, or Solr. Optimize the Results Pages: Search engines often rely on metadata to organize search results, but incorporating traffic and sales data further improves conversions. For example, our Avatria Convert leverages existing Google Analytics data to optimize the order of products on search results pages and improve conversion rates. Read on to learn more, or sign up to try it for free. eCommerce users that don’t use site search are using categories and navigation links. Unfortunately, many eCommerce shops fail to optimize these pages even for desktop computers. The importance of optimizing categories is even more important for mobile users that can only see a few products at once. Let’s take a look at a few strategies for optimizing product categories and navigation menus. Don’t forget to download our checklist of site search best practices that go above and beyond design. Most mobile phone users are familiar with hamburger menus that are commonly used to house navigation elements. While this approach conserves valuable real estate on the screen, few visitors are likely to click the hamburger menu item to navigate to category pages and find what they need. Faceted search is a great way for customers to narrow down their options within a category using certain criteria. While it’s not always necessary, faceted search works great in instances where there’s a wide range of configuration options or price ranges, as is the case when looking for items like laptops. Until recently, most eCommerce shops only provided faceted search as a filter option in an entirely new window. Amazon and eBay have since pioneered a “tray” approach to display faceted controls overlaying a product category. This can help visitors better understand how to use the functionality since it doesn’t replace the entire screen. 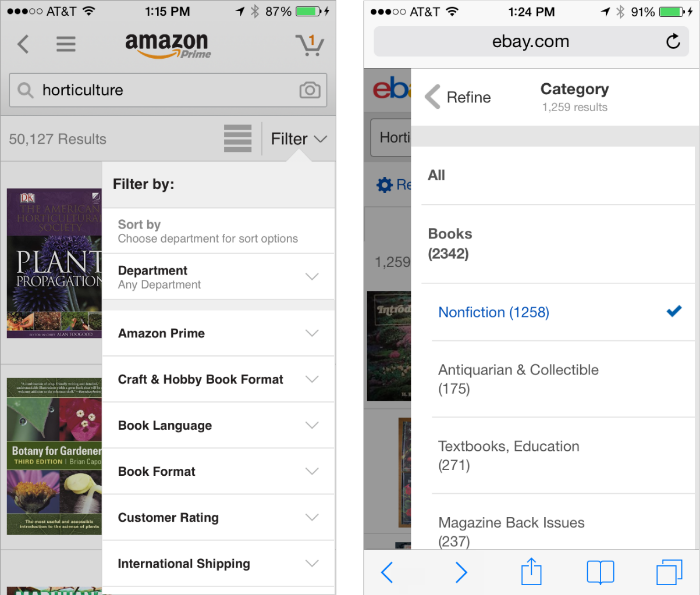 Product list order is just as important in categories as in search results—especially on mobile devices. By leveraging traffic and sales data, you can intelligently organize products based on what customers are most likely to buy. Avatria Convert helps you improve conversions by doing the heavy lifting for you. By combining your existing Google Analytics data with machine learning algorithms, we predict the optimal product orders for all types of products lists, including categories and search results. In A/B tests of our existing customers, we’ve found that optimizing product list order can improve conversion rates by up to 40 percent, per-session value by up to 56 percent, and revenue by up to 70 percent. Sign up for free to get started today. Use this checklist to ensure that your site search is optimized to produce the best conversions.